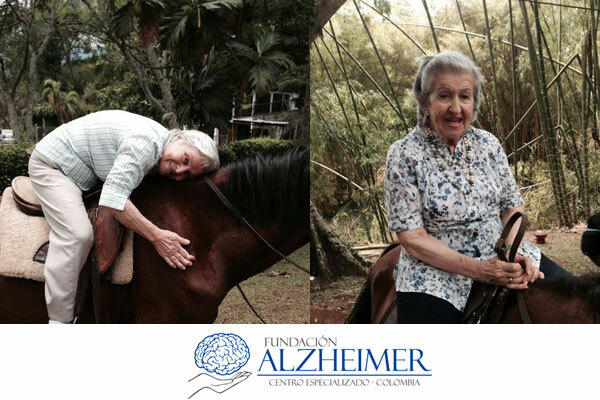 Two years ago, the Alzheimer's Foundation began implementing equestrian activities as part of its therapeutic regime. The activities are organized in controlled environments, and are intended to motivate patients in both early and advanced stages of the disease. In 2015 began the therapy with the more critical patients, by taking a Pony to the Day Center for them to interact with. The therapy's main goal is to reminiscence, taking into account that many of our patients grew in the countryside, horseback riding is a childhood activity practiced for fun and relaxation and they could relate to it. Patients reacted positively from the beginning, many of them remembered with joy childhood and adolescence memories. The therapy's results were very positive, since it broke their daily routine in the therapeutic room and gave us the opportunity to work outdoors. It impelled their motivation and enthusiasm, even the patients who didn't relate with the normal activities had significant social improvements. It is an innovative tool and a unique therapeutic support. Its application helps those who suffer by dementia to improve attention, motivation and provides a feeling of security and familiarity. This therapy facilitates in patients with dementia the expression of feelings like love, protection, tenderness, reactions of surprise, perplexity, admiration, among others. It also had our patients and their families improve their well-being and quality of life.